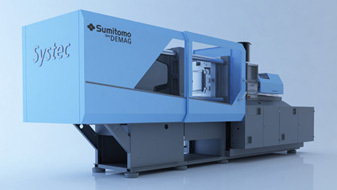 The Systec is a hydraulic injection moulding machine from the European product range of Sumitomo (SHI) Demag. It is characterized by sturdy and compact design, and offers much clearance for large moulding dies. The standard linear slide of the mobile mould plate guarantees highly precise clamping movements, and thus significantly reduces mould wear. Another benefit that enhances this machine’s degree of precision is the complete and autonomous control of each individual axis. In terms of energy efficiency, the Systec class impresses with its sophisticated drive system. For frame sizes of 1,300 kN through 20,000 kN, the toggle drive provides a further reduction of the power requirement as compared to all-hydraulic systems. Moreover, the toggle clamping units made by Sumitomo (SHI) Demag offer more benefits through their high degree of rigidity and best kinematic design that allow for highest straight line velocities or positioning accuracies. Short cycle times, high degrees of precision, and high levels of machine availability provide our customers with a maximum of efficiency and an optimal price-performance ratio. Another feature that will help you keep operating costs low is the autonomous cooling circuit (“activeCool+Clean”) that will facilitate an oil service life of forty thousand (40,000) hours or more. Modular injection units for the most versatile and varied plasticating jobs, various configuration levels, and a comprehensive range of options make the Systec a real flexible machine for practically any production job. The Systec class is available with clamping forces from 250 through 20,000 kN. Large injection moulding machines with clamping forces starting from 13,000 kN are also available from our System Large series.